REAL WORLD: Host profiles can’t manage every configuration option you might want – for example they can’t configure jumbo frame support when using iSCSI, can’t configure iSCSI HBAs (in fact host profiles won’t even notice from a compliance point of view if iSCSI is enabled or not), can’t set VM swapfile location, can’t enable lockdown mode, and can’t configure the load balancing algorithm for Pluggable Storage Path (PSP) among others. Some larger shops skip host profiles for this reason – if you have to use scripts at all you might as well script everything and have one place for all your settings being the logic. Interesting post on SearchServerVirtualization. They’re also not that flexible – if you only want to configure storage for example (maybe because a scripted build configures networking) you can’t turn off selected configurations. See this blogpost for details. Host Profiles are not hierarchical like MS Group Policy, so you can’t apply multiple profiles to increase flexibility – it’s one profile per host, and one profile only. Pretty limiting! Once you’ve exported and reimported a host profile its connection to the original reference host is lost. This means you can’t use the ‘Update profile from reference host’ option to refresh the profile if the source host changes. Configuration settings. These determine the desired configuration of the host, for example ‘connect vmnic0 and vmnic1 to vSwitch0’. Compliance checks. These determine how the compliance check is validated, for example are vmnic0 & 1 connected to vSwitch0? If the host only has one pNIC the configuration won’t apply correctly and this check will fail. Users and user groups – these are NOT captured from the reference host and must be created manually. Likewise while a host profile can add users/group it will NOT remove extras or alert if extra users are added manually (Technical Overview p19). Authentication (new to vSphere 4.1). This can be used when AD integrated authentication is enabled on a host. You’ll probably need to create extra sub-profiles of your own, based on your infrastructure and what you need host profiles to do. If you wanted to mount four NFS datastores on every host for example you’d have to create an extra three sub-profiles under Storage -> NFS storage configuration. Each sub-profile would hold details for one NFS export (IP, path, read/write etc). Policies allow host profiles to be more flexible (compared to fixed values) by specifying what to do instead of how to do it. A typical use is networking. 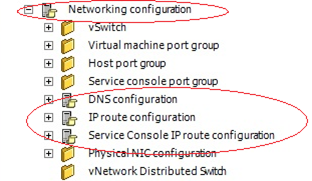 Rather than specifying just the number of NICs for a vSwitch you may want to be more specific and choose the NICs based on name, PCI namespace, bandwidth etc (this is useful for blade environments in particular). Policies allow you to do this. Create a vDS using the VI client connected to vCentre, with no hosts attached. Add the host to the vDS, then delete the vSS on the host. The alternative method is very similar but minimises the ‘per VM’ configuration. At step 3 simply leave the vSS in place and continue to create and apply the host profile. On the vDS use the ‘Migrate virtual machine networking’ option to seamlessly migrate the VMs. Finally remove the vSS from the reference host, recreate the host profile and reapply. Voila! Full details of this process and more details about the vDS can be found in VMware’s vNetwork Distributed Switch migration and configuration whitepaper. What about PowerCLI cmdlets for host profiles? Good example at Damian Karlson’s site, or Hal Rottenberg’s guide to using host profiles with PowerCLI.